Pensacola, Fla. (April 6, 2018) – Visit Pensacola is pleased to share that Pensacola Beach has been recognized as USA Today’s 10Best Readers’ Choice 2018 Best Florida Beach. The area boasted not one but two nominations for the contest with the Gulf Islands National Seashore coming in third place. To add to the celebration, the beaches of Northwest Florida dominated the competition with Panama City Public Beach coming in second and Navarre Beach coming in fourth. This achievement follows 20 destination nominations from an expert panel followed by a period of public voting. Nominees for all categories are chosen by a panel of relevant experts which include a combination of editors from USA TODAY; editors from 10Best.com; relevant expert contributors; and sources for both these media and other Gannett properties. Then it is up to the public to decide. 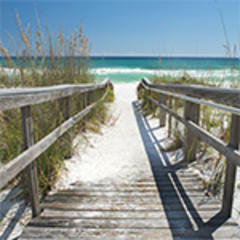 The Pensacola Experience is unique to every traveler that comes upon its shores. USA Today’s 10Best Readers’ Choice award has also recognized Gulf Islands National Seashore as Best Florida Attraction (2018), Best East Coast Beach (2016), Best Florida Beach (2015) and Johnson Beach was voted No. 2 Best National Park Beach (2016). Travelers have endless opportunities to explore eclectic cuisine, a boisterous downtown complete with nightlife, culture, and arts, and over 450 years of history. For more information on the Pensacola Bay Area, visit visitpensacola.com.